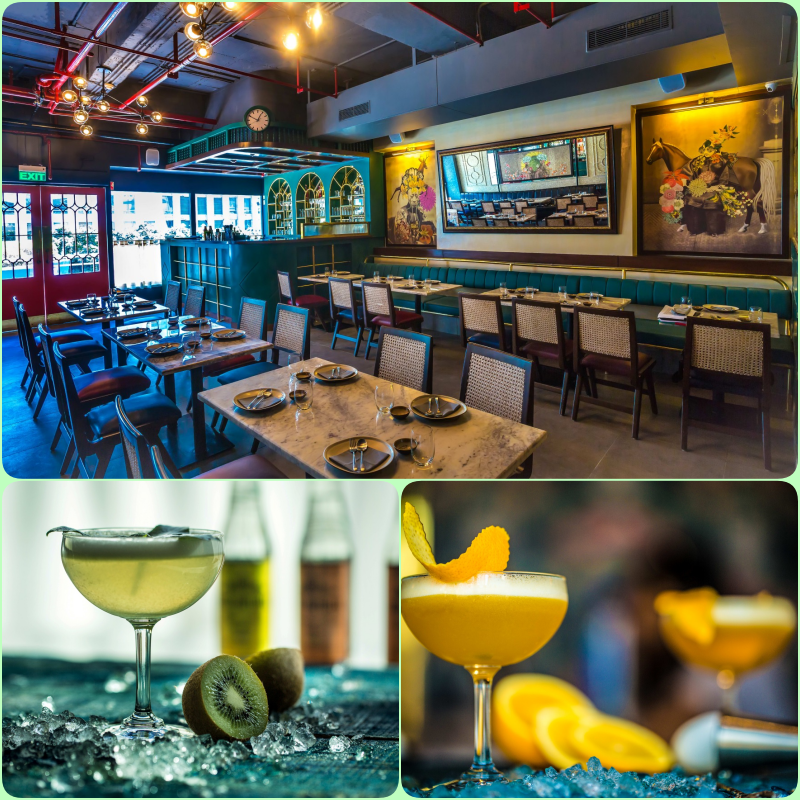 Over the years, Mamagoto has converted many Chinjabi loving Delhiites to enjoy pan-Asian flavours, including Thai, Malaysian and Burmese. Mr Mamagoto is now going further by introducing Japanese, Mediterranean and even Peruvian influences. The first restaurant is already operational at DLF Cyber Hub (Gurgaon), and there are talks of opening one each in Mumbai and Delhi shortly. ideal for millennials and families alike. 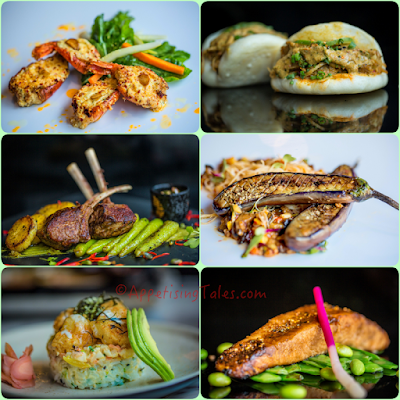 Head of Cuisine, Chef Sumit Choudhary started his culinary journey by training in Japanese. He then moved on to a restaurant brand that popularised the ‘bao’ across the country. So it is not surprising to find entire sections dedicated to sushi and baos. And Mr Mamagoto impresses us on both accounts. The Kaani and Avocado roll comes with a thin layer of rice, perfectly ripe avocado, delicious crabstick and a very neat presentation. The Salmon Onigiri is also executed very well. The salmon is done two ways, one is marinated with teriyaki and ponzu, and the other is mixed with Japanese mayonnaise. The result is a wonderful balance of flavours amidst this traditional Japanese rice ball. The Prawn Stack is a twist on the traditional rice ball. Here, the sushi rice is mixed with spring onions and a light wasabi cream, the prawns are marinated with miso, tempura fried and stacked up on the rice. The accompanying wasabi, even though not fresh, hits the spot. “It is a combination of powder and tube,” reveals Chef Sumit. If you like wasabi, do try the Wasabi infused Chicken salad. It takes a while to arrive since the chicken is baked freshly, but the wasabi kick that one gets from the chicken as well as the deliciously dressed greens is almost addictive. Top: Baked Prawns with Thai infused oil; Pulled Pork Bao. Middle: Lamb Chops; Star ferry Aubergine. Bottom: Prawn Stack; Miso Glazed Salmon. The choice of dimsums includes gourmet combinations like truffle and edamame, prawn and enoki , duck pottinger puffs and chicken wrapped with pok choy topped with a flavourful blackbean sauce, among others. Again, the accompanying sauces are made with quality ingredients and maintain a perfect balance of flavours. Mamagoto had introduced a selection of baos briefly, and Mr Mamagoto now baos and tacos in its main menu as well. While we are tempted to try the fried goat cheese taco, we finally settle for the pulled pork bao. Unlike the typical char siu flavor this one comes with a slightly spicy Burmese curry that complements the sweet bao rather well. 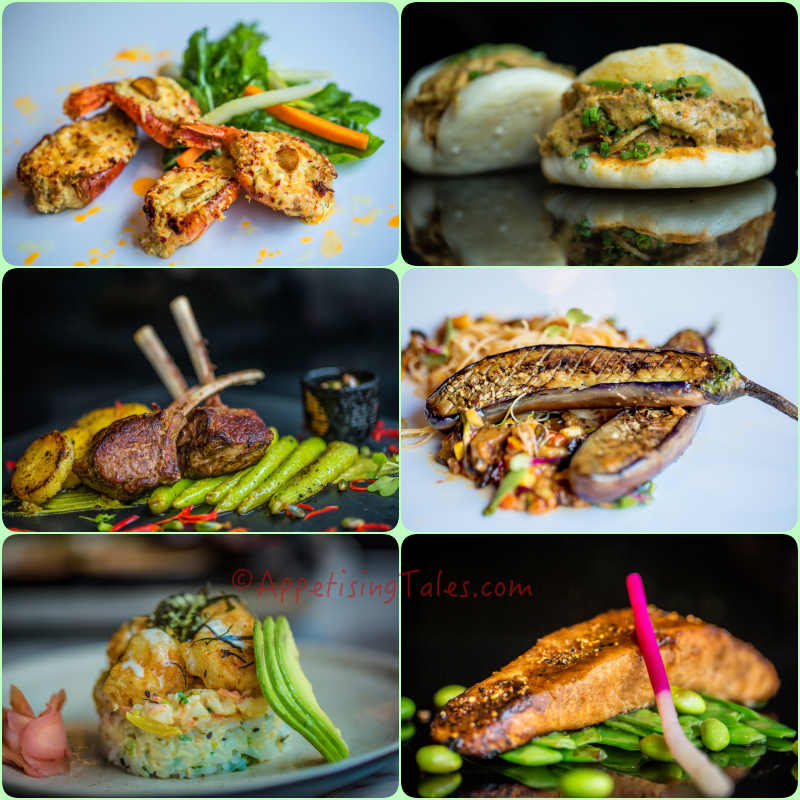 While Mr Mamagoto has retained some of the popular woks and meals in a bowl from Mamagoto that are sure to please the regulars, the mains are exciting and showcase some off-beat fusions. The New Zealand lamb chops are served with smoked pimentos, grilled sweet potatoes and a luscious pistachio puree. Although we would have preferred some sauce to go with it (only because one is normally served some jus with lamb chops), the quality of the New Zealand lamb shines through the wonderful spice mix that it is coated with. Another wonderful main is the Miso glazed salmon that is as delicious as expected. The menu promises a choice of hand-crafted cocktails, but liquor license is awaited (it should come in about two weeks). Desserts are non-Oriental and include popular choices such as the chocolate lava cake, deconstructed apple pie and the Mamagoto special caramel sponge cake. We try the panookie. that turns out to be a warm, chewy chocolate chip pan cookie with a scoop of vanilla ice cream that is ideal for the onset of the Delhi winter. Mr. Mamagoto, First Floor, Shop No. 420, DLF Cyber City, Phase 2, NH 8, Gurugram, Haryana – 122002.